24th December 2003 Christmas Eve! We checked out of Nicos and headed straight to Big Foot to sort out what we could fit in over the Christmas period to make the most out of our short stay in the Torres del Paine National Park. Having made a few plans we spent the morning stocking up on food from the local butchers and supermarket and then set about hiring a ground tent. 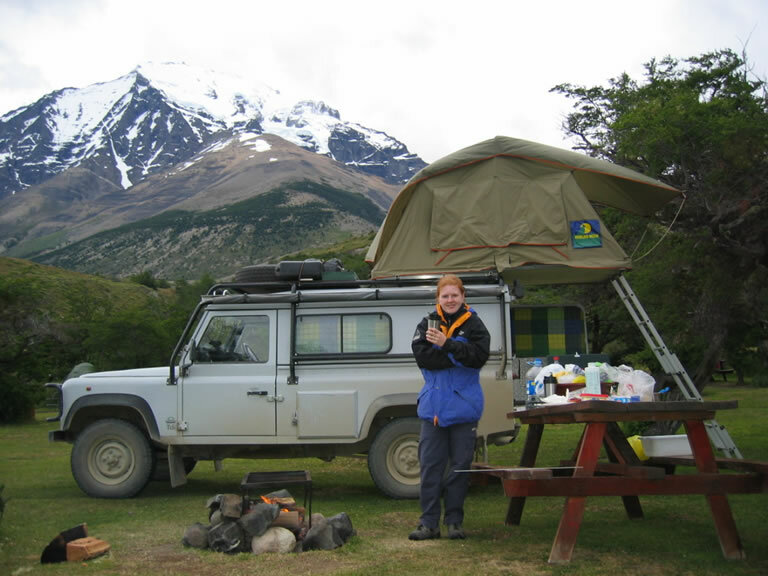 There are lots of places that hire out tents and it is worth shopping around as prices vary somewhat. We found a good bargain in a small camping shop - just $2 a night. It felt nice and lightweight, although we weren't sure whether or not it would stand up to the strong winds we would be expecting in the park - not to mention the rain. 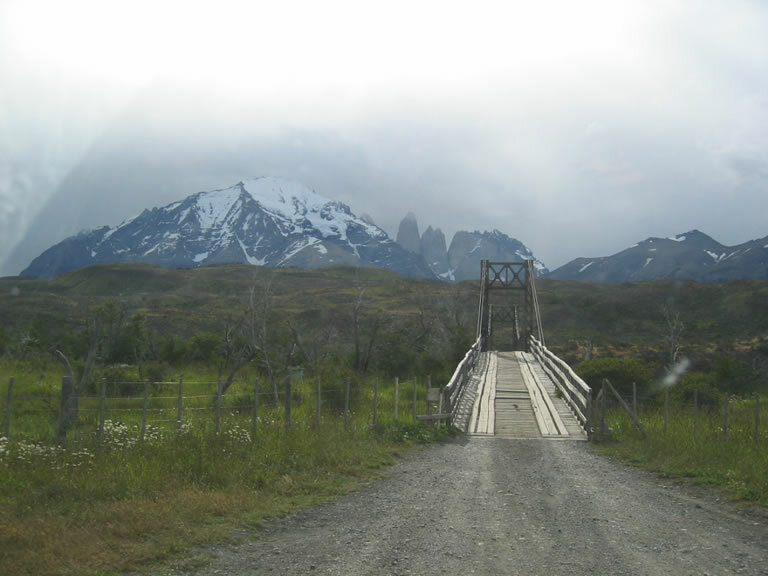 Before heading off into the Torres del Paine National Park, we made a last visit to El Living and enjoyed a hot, spicy soup and couldn't resist taking away two slices of Stollen and 2 pieces of courgette and chocolate cake. 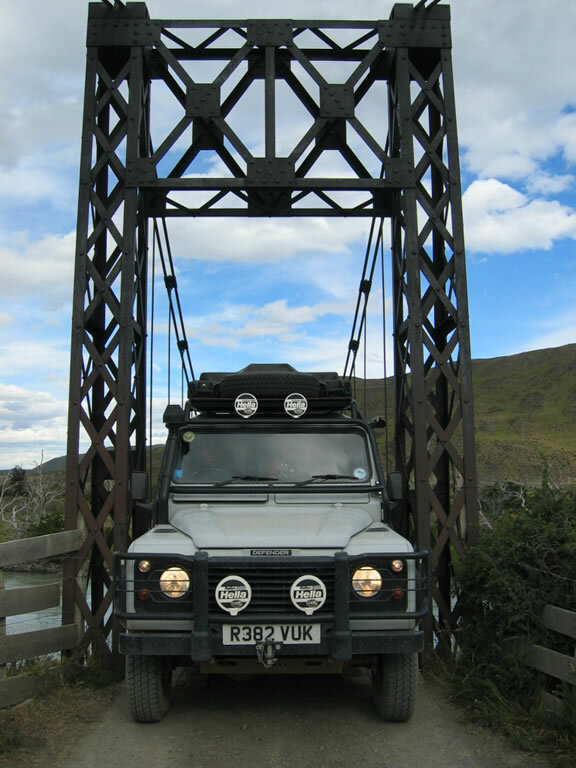 The park is about 112km north of Puerto Natales along a fairly good but sometimes gravelly road. Keep an eye out for the mine fields marked by the side of the road. !As you enter the park, you pass a junction for the Laguna Verde section of the park. We continued on past this to the Porteria Sarmiento, the park's main entrance. Here you have to park up and pay the entrance fee to the park - about $15 each. There are park guards there to answer any questions you might have regarding ferry schedules etc and they hand out a useful map of the park - you only one per vehicle/group much to the consternation of some moaning Americans. The next part of the journey was not so easy. Shortly after leaving the information centre we came across a bridge which looked a little too narrow for the Weasel to cross. We were convinced this was the correct route to Camping Los Torres, so Sue got out and walked in front to check the Weasel didn't get damaged as it gingerly made it's way across. There was probably only an inch to spare either side of the vehicle, and that was with the mirrors turned in. Deciding it was time for a Christmas drink, we quickly set up camp and headed off to the Refugio for some wine and to pay for the camping (3,500 Pesos/$5 each). The staff in the Refugio were busy preparing a huge festive buffet dinner for Christmas Eve and the small communal area soon started to fill up. But we had our own traditional Christmas dinner in store - turkey breasts, peas, carrots, roasted (well, fried) potatoes and sage and onion gravy, all washed down with hot wine. So we didn't stay too long - just long enough for a couple of drinks to warm us up and chat to a few people. Later, we were just settling down to our Christmas dinner, enjoying the peace and quiet, when a man appeared out of the dark with a large video camera. He was from a Chilean TV show and was basically going around the campsite, asking the various nationalities to sing a Christmas song from their home country. The first and only song we could both think of was "We wish you a merry Christmas". Not the most tuneful rendition after a fair amount of hot wine. No doubt our part of the film would end up on the cutting room floor!